Live and Love Life.. Every day is an Adventure! A Bracelet For The Outdoors Badass! If you are a true adventure enthusiast, you will agree that life in the outdoors is no fashion show, but there is a modish bracelet out there that will be seen wrapped around the hands of experienced outdoors-men like Bear Grylls. This bracelet not only looks good, but makes you the outdoors ultimate badass and could also save lives! Get one of these babies and be a true outdoors badass! What are we talking about? The multi-functional Paracord bracelets! We have all probably seen these bracelets as they have now become mainstream, with many people sporting them. Most people wear paracord bracelets as a fashion statement. What I need you to know is that these bracelets are not only swanky, but also very handy in instances of having to survive in the wild! These bracelets are crafted from 3 to 6 meters of the same nylon cord that has been used as suspension lines in parachutes since World War II! The truth is that a majority of those who wear paracord bracelets will most likely never deploy them in a true survival situation, but as we always say while in the wild; it is better to be ready than sorry! So what is the “survival” part of a 5 in 1 paracord bracelet? 1. Get Your Direction Right! Are you going out to hike a new trail? It is definitely important to have your directions right. These bracelets come with an in-built Military Grade Embedded Compass for precise orientation. To serve you best in the rough of the wild, the compass is abrasion resistant and waterproof! 2. Make A Distress Call! Many dangers lurk in the outdoors and any adventurer should be able to make a distress call whenever caught up in a dangerous situation. In the event of an immobilizing injury, or when lost in the wild, there is no need to sit on a rock and cry. Be an outdoors badass and use the survival bracelet whistle! Blow three loud blasts in quick succession to alert those around you that you need some help. This badass whistle can be heard miles away! 3. Keep Warm or Roast Some Prey! Whenever out in the wild, a fire is one of the most important things to have. Simply put, no campsite will be a campsite without a fire. Whether it is a fire to keep warm, ward off wild animals or send a smoke signal, how about you be an adventure badass and make it using the fire steel and fire striker that comes with your 5 in 1 survival bracelet? 4. Cut Through It! Ever held a tin of beef or sardines in your hand ready to eat after a long hike, only to realize that you forgot the tin cutter right on your bed as you packed? The 5 in 1 survival bracelet will save you from hurtling back to the stone age as it comes with a neat mini-saw or cutter, and you would not need to bludgeon your tin with a rock to access it’s contents! The stainless steel mini knife is zigzag shaped and sharp enough to cut through ropes as well. You can swim or shower with it as it is rust resistant! 5. Rope It Up! The main component of a 5in 1 survival bracelet is the 2 to 6 meters paracord. This is a badass rope made of several clusters of nylon fibers which makes it rot and mildew resistant! It is known to hold weight as high as 250kg without snapping, which is the reason it is used in parachutes as it can withstand the force exerted when they launch. An outdoors badass backpack made from paracord, sticks and a raincoat! Once the paracord in the bracelet is unraveled, one’s imagination is the only limit to the number of uses it has! Adventurers can use this cord for hacks as simple as replacing a broken boot lace, to building traps for prey if lost and in dire need for food. Making a shelter – This taut rope can be used to hold together branches while putting up a make-shift shelter to survive a cold night in the wild. Making splint for a broken limb – If you or one of your fellow adventurers breaks a limb while in the outdoors, a paracord can be wrapped around two pieces of wood, to hold the injured limb together until you get to a health facility for specialized care. Use the inner strands as fishing line – One can tear the outer covering of the paracord and pull out single nylon strands which can be tied to a tensile stick or rod to build a fishing rod! Making a perimeter trip line for warning – Paracord can be tied around a selected campsite to act as a ‘fence’ to keep off intruders as well as act an alarm system should anyone or anything opt to trespass. Christmas is around the corner, so if your boyfriend, girlfriend, brother, sister, mum or dad is an adventurer, how about you make them a badass adventurer by ordering one of these natty bracelets for them? You can also get cool with your own paracord bracelet and be well on your way to conquering the outdoors! The trek, hiking and camping culture(s) are fast growing among the Kenyan adventurers. Every weekend there is a team heading out to an adventure at one place or other. The trails ventured are usually forests, ranges, moorlands and sometimes valleys with tough terrain and heavy vegetation cover. In October 2016 a pack of four adventurers wandered away from the main hiking group as they hiked the Aberdare forest. They were found two days later after a rigorous rescue mission that involved the Kenya Police, Kenya Wildlife Service and a search party of about fifty locals. Have you ever asked yourself how it would feel to be lost in the wild? What would you do? How would you be safe from the wild animals? Do you think you would be able to survive? 1. Inform family or friends of your intended trek or hike It is highly advisable to leave a map of where you intend to quench your adventure thirst, as well as the itinerary clearly showing the intended departure and return dates. Most trek/ hike areas in Africa do not have phone coverage. The coordinates on the map would therefore come in handy in establishing the estimated area you should be in, in the event you get lost or injured. Lost? What would you do? 2. Travel in even numbered groups. Large groups on a trek may be a handful for the guides. They should be divided into smaller numbers easily manageable by the guides. Groups of four are better than three. If someone gets hurt two members of the group can go look for assistance, while the remaining member can stay with the injured person to help with first aid and emotional support. 3. Stay where you are when lost, panic can make one wander even further into the wild. Wandering especially in the dark could result in injury as visibility is low and the terrain may be foreign to you. What you should note is that staying at one spot increases the chances of you being found. You can consciously scout the surrounding area for resources like water, but be keen to return to ‘point zero’ every so often. Help is likely to find you here, more than anywhere else. 4. Signal distress as soon as you are injured or realize you are lost, the first thing you should do is to signal your distress to anyone that may be in the vicinity. Shout, blow your whistle, or do anything that would attract attention as long as it doesn’t result to further injury or waste of much needed energy. Note: the international distress call is three bursts of a whistle in quick succession. You can also You can also seek high ground where you can light a fire using wet twigs to produce smoke thick enough to be noticed by a search party miles away from you, or a search plane hovering overhead. It is also recommended to carry or wear bright colored clothes as these can used to wave for help. 5. Save your drinking water. Water is high priority in survival situations. Always remember this when planning for your treks, hiking or camping adventures. One can survive weeks without food, but only a maximum of three days without water! So, save it the best way you can. It is advisable to avoid exposure to the hot sun as this may result to high levels of dehydration. In desperate times, you can also collect dew off plants in the morning to quench your thirst. 6. Light a fire. As the darkness creeps in, the temperatures are bound to drop. It is therefore important to build a fire before if gets too dark. The fire will come in handy in keeping you warm, warding off any wild animals that may be in the area, and it can also act as a signal to a search party that maybe looking for you. Make sure that you start by clearing a circular spot, protect it with rocks (if possible) to make sure that the fire does not spread unnecessarily. 7. Think positive. Do not panic is the paramount rule in the event that you are lost in the wild. No matter how grave the situation may seem, keep your mind clear and stay positive! Sing, or scream (if you must) to stay calm. Keeping the right frame of mind ensures that you are alert, and can positively respond to stress. There’s always something you can do to help yourself. If things go wrong as they sometimes can, always remember you can take back control of the situation if you can take control of your mind! That is what he said before he proceeded to do crazy back flips on her. He eventually stopped from exhaustion, and a glint of immense excitement seemed to have permanently patched on his face. He sipped his beer as his chest heaved heavily. He proceeded to dance on her. There was no guessing how much fun he was having with her! Like many before him, she had him in her grip. She of enchanting beauty and from a lineage of exquisite world renowned beaches, played host to us on new year’s eve. Her name is Kendwa beach! A week before we left Nairobi, I had a meeting with Mukhtar The Head Adventurer at Bunduz. Typical of his meticulous self, he took me through every detail of the 10 day road trip from Nairobi to Zanzibar and back. He mapped out the route we would use and the hotels we would stay in. I had to give it up to him on his knowledge of adventure trails and how he leaves nothing to chance in his planning. I however blame him for not warning us of how much fun we would have on this round road trip that would see us leave Nairobi, go through Arusha, Dare-salaam and on to Zanzibar, before proceeding to Diani, and eventually back to Nairobi. Adventure is part of me, I love it and I preach it. I can tell when one is getting a raw deal and when it is worth every dime. This year’s end of year road trip was one of a difference. How you know that a company is mature in it’s trade, is by the options it offers it’s clients. Bunduz definitely did impress me on this one. They have moved away from the traditional way of delivering an adventure package where everyone is bundled into a truck or a van and driven off to the set destination. Bunduz set out the adventure route and gave the adventurers a choice of the activities they wanted to take part in, and on how they wanted to travel. They had the options of the overland truck, land-cruisers and a package for motorbike enthusiasts who wanted to soak in all the fun with wind blowing in their hair 🙂 Talk of diversity! All set to leave Nairobi for the 10 day, action packed road trip! When we started writing on adventure, only a few Kenyans were interested. Going by the numbers that signed up this time, I can confidently say that the culture of adventure is fast growing among Kenyans of all ages! From scenic foreign towns, to pristine beaches offering an escape from the busy city life, to those action-packed with thrilling water sports, parties and adventure; there was plenty of options for anyone looking to spend the end of year in style! Early the next morning, some of the adventurers set out on a game drive and tour of the world renowned Ngorongoro Conservation Area which lies 180Km West of Arusha. This crater being one of the world’s most unchanged wildlife sanctuaries, boasts of unparalleled beauty. Some of the adventurers opted to explore the town of Arusha. I personally opted to visit a crafts project named Shanga that employs more than 55 physically challenged artists to produce high quality and unique handmade jewelry, glassware and decorative paintings from recycled material. The passion that those at Shanga put in their work can be felt as one takes a guided tour through the establishment. It is a landmark of the African resilience and will to win, despite the odds. It was started by one Saskia Rechsteiner back in 2007. We also had the pleasure of visiting the little known Lake Duluti. The crater in which it is formed is a subsidiary vent of the Mt. Meru which towers 4,566m over the tranquil lake. The lake has water all year round. It is rumoured that Arusha plans to utilize the water to supply the entire town! The thick forest around the lake is habitat to snakes, monitor lizards, and a large number birds that can be heard chirping from the papyrus reeds. From a Arusha, we hit a 600km stretch of good road into the former Tanzania’s capital of Dar es Salaam. On our way, we drove along the imposing Usambara Ranges. I couldn’t help but wonder how it would feel to clamber up the rocky faces of the range. Daar es Salaam, the city that grew from a small fishing village now stands beautiful and proud in its humble splendor. It is easy to notice that efforts have been put in place to give this city some order. I was pleasantly impressed by the organized bus system which has seen some roads set aside for use by the blue city buses and no other vehicles. The buses ply the city on an effective time schedule ferrying passengers who no longer have to carry cash, but an automated fare card to board the bus! A peek from my hotel room in Dar. Notice the blue bus at the bottom. Dar es Salaam felt like being underneath a dump blanket inside a furnace! It was very hot and humid. The most conservative of dressers, found it difficult to stay covered up. Even when it drizzled like it did on our night of arrival, I couldn’t dress in more than just a vest and a pair of light cargo shorts. Happy adventurers on our way to Dar! By this time, all the adventurers knew each other and those of similar exploring interests had naturally gravitated to each other. As you walked down the hotel corridors or dug away at your meal in the restaurant, It was common place to hear murmurs of the activities people were looking forward to undertake in Zanzibar. After one night in Dar, we were on our way to Zanzibar which was to be the epitome of this tour! Bunduz made sure that we traveled in class to Zanzibar. A seat in the the clean, air conditioned, multi-decked ferry dubbed Kilimanjaro VI was a saviour from the coastal town heat. The engines roared, as passengers shuffled down the aisle to board the ultra-modern vessel. An announcement and a departure honk later, the Dar es Salaam beautiful shoreline was fast drawing away from us as the vessel gracefully tore through the Indian Ocean waves. The mood on the ferry was alive and celebratory. Cheerful murmurs were audible as travelers chatted away. I opted to travel on the top deck taking in the view of the turquoise blue water and enjoying the breeze. Some travelers cupped their faces in their palms clearly afraid of sea travel, clutching onto their sick bags just in case their breakfast opted out, others pointed and clicked their cameras randomly in all the directions of the compass, while others plugged in their earphones and hummed to tunes totally oblivious or uninterested of where we were. We were soon out in the open blue sea, no land and no other vessels in sight other than the occasional fishing boat which seemed so tiny and appeared like pins on a giant blue pin cushion. Two hours later, we docked in Zanzibar and the 25$ ferry trip felt worth every dime! Zanzibar is a laid back country that is also quite strict about maintaining and conserving its environment in the most natural state. On arrival, the customs officers who stamped our passports on entry also checked our luggage for any polythene bags as they are not allowed into the country. I always find it very encouraging when a country takes its environment seriously. While in Zanzibar, I felt silly to have thought Dar es Salaam was hot! This was the epi-center of the heat! This was to be home for next couple of days! Zanzibar is a diver’s heaven! We later traveled to the Nungwi area of Zanzibar to Kendwa beach where the ultimate jump off party was set to be held. All the roads led to Kendwa Rocks, an establishment that holds an electric new years party, year in year out. The popularity of this party was evident from the number of people that thronged the beach. There were revelers from Kenya, South Africa and other parts of the world! The ladies dressed to impress and the fellows spent to make a ‘kill’ 😉 The loud music tore through the air and people danced the night away. I took a walk to the beach and it was refreshing to see couples sitting in the sand, sharing bottles of wine as they waited to usher in the new year watching the lazy waves break on the white sandy shore. 5… 4… 3… 2…1.. the crowd counted, and at the strike of midnight we were treated to a spectacular fireworks show! “Happy New Year!” Everybody shouted as they jumped around in joy! As I sipped my chilled beer underneath the velvety star studded sky, I prayed that this energy and beauty would carry on through out 2017! Beach party at Kendwa Rocks, Zanzibar! As if seeking to overdose on beach therapy, we left Zanzibar, made a slight stopover in Dar es Salaam before heading out to the Kenyan South Coast by road. Our next stop was Diani beach! On the scenic route down from Dar to Tanga and through the Lunga Lunga border I could see adventurers going through the photographs they had taken in Zanzibar, and recapping on the escapades they had at Kendwa. We arrived in Diani, Kenya a few hours into the night. Not much could be done as most of us were tired from the day’s journey and some were looking forward to undertaking more action packed activities on the next day. After dinner, some retired early while others opted to experience what the Diani nightlife had to offer. Early the next day, a bunch of us left for a day excursion at the Wasini area of South Coast. The trip saw them go to the unspoiled Kisite Mpunguti marine park which lies in the coral gardens, protects marine life and acts as a breeding ground for migratory birds. As was witnessed in this occasion, it is not rare to spot a school of dolphins swimming and sometimes playing in a way to enchant the visitors to this part of the Indian Ocean! Understandably, some of the adventurers opted to rest in at the beautiful hotel (Amani Tiwi Beach Resort) where we were putting up. Walking the long white beach, relaxing in the beautiful swimming pool and sipping cocktails from the pool bar, or pampering self at the hotel’s spa were some of the activities they opted to indulge in. Amani Tiwi Beach Resort, a true gm on the Kenyan South Coast! The culmination of this tour was by some adrenaline junkies who found it fit to jump 15,000ft out of a perfectly well running plane flown by a sober and able pilot! The Diani Skydive is the company of ‘crazies’ that has people scrambling for a chance to take on this fear-conquering feat. It was difficult to actually get a slot at this time of year. Bunduz had to call Diani Skydive in advance to book the slots! We were greeted by an air of busy fellows and ladies, all in easy wear branded in their company colours. One guy was on his laptop working on the videos of those that had jumped earlier in the day, another was on his hand held radio coordinating the jumps, while another lady welcomed us to the lounge area. Despite them being busy, it was clear that they all enjoyed what they do! Kudos Diani Sky Dive! The jumpers were advised to maintain a ‘happy-banana’ pose and cooperate with their tandem jump instructors to avoid a bumpy or rough free fall from the sky. After the short introduction session, the jumpers were strapped to their skydive gear and off they were whisked to a nearby airstrip for the take off. Gear on, brave faces on and ready to skydive! The adventurous Alulu Zain and her two daughters took on the skydive challenge by the horns! On the beach, other adventurers had an awesome time relaxing and enjoying the beautiful scenery as they waited to cheer those that were landing from the skydiving. A large T shaped mark made from red cloth was on the beach to guide the jumpers on where to land their parachutes. After a short while they started appearing in the sky as minute objects falling, and eventually open parachutes were visible slowly gliding through the humid air to the beach below. A landing straight on the red mark! Adios from the pack of adventurers that rocked the 10 days Bunduz road trip 2016/2017! High Adrenaline Triathlon.. The Forest! 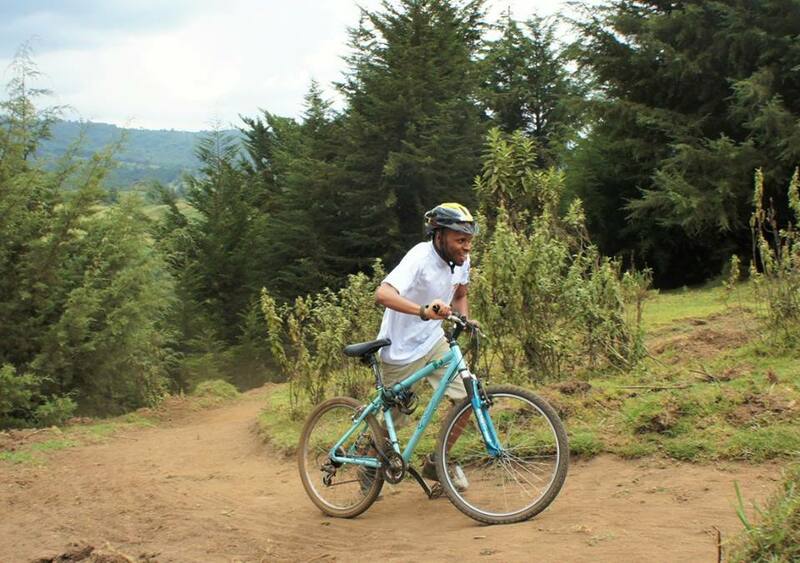 The Forest; an adventure park within Kereita Forest! If you would avoid the party on a fine Saturday night so that you are up early on a Sunday morning, ready to take part in an adventure triathlon at a location 30km away from Nairobi and 2,000m above sea level, then this article is not for you because you already know that nothing beats spending an expendable minute while high on adrenaline! The map that each team tried to beat in the best time. I was honoured to be the Bunduz triathlon team Captain. Just as the adventure tours that Bunduz organizes, we decided that our competition ethos would be to do our best in the allocated tasks, but also make sure that we have great fun while at it! Our team trick was simple; Stay safe, have fun, endure the trail and have more fun! If whenever you are handed a disclaimer form to sign, your heart starts to pump with excitement in anticipation of the ‘danger’ ahead, then you are a true blue adventurer and everything Bunduz resonates with you! Yes, we signed the disclaimer forms and got instructions on the dos and don’ts of the triathlon trail. The Forest is a new adventure park that has opened it’s doors in the hinter-lands of Kenya with an aim to interest local and international tourists in locations that have hardly been explored, unlike the coastal beaches and our world renowned national parks! In their offering of high adrenaline alternative adventure, the safety crew at The Forest leaves nothing to chance. Harness, check! Locks, check! The Bunduz team was taken through all the safety measures to observe while undertaking two of the sort of technical sports in the triathlon. These are; zip lining and archery. The speed and caution with which the safety team at The Forest operated, gave us confidence that they understood what they were doing. A few rehearsal slides and arrow shots later we were ready to hit the trail! Alternative adventure is what The Forest offers! The first activity was the zip lining! The Forest boasts one of the longest zip lines in Africa, and is ranked among the safest in the world. Armed with all the safety advise, what you are never warned about is how fast you are forward propelled on the zip line! Zooming through the light high altitude thin air, listening to the humming vibrations of the zip, one loses themselves in the picturesque bird-eye view of Keriata Forest, dangling at almost 100m off the ground. The feeling is exhilarating! Of utmost importance is paying attention to the Zip line crew instruction to apply the palm brake to reduce speed before landing. You cannot be told how difficult it is to tear into a sprint, at an altitude of about 2,000m above sea level, right after a 2.4km heart sinking zip line ride. You need to try it! On landing, each team member had to run up a steep hillside trail to get to the station with all the heavy safety harnesses on! Running up a steep hillside, to the next competition station right after zip lining. At this point, a majority of teams had lost some time. Particularly those with skinny zip-liners like ours :-). Being feather-weight does not only have disadvantages on the boxing ring, but on the zip line too! It sometimes means that one cannot propel themselves to the end of the zip line course and therefore have to turn backwards at a 180 degrees angle and pull self to the end and losing precious time. The next activity afforded each team to salvage time lost depending on how good at archery the team members were. Hitting the bull’s eye saved any team a whopping 60 seconds! Lock… Stretch… Aim… Release..! Concentration, having a ‘conversation’ between your hands, eyes and the bow, meant a good shot! 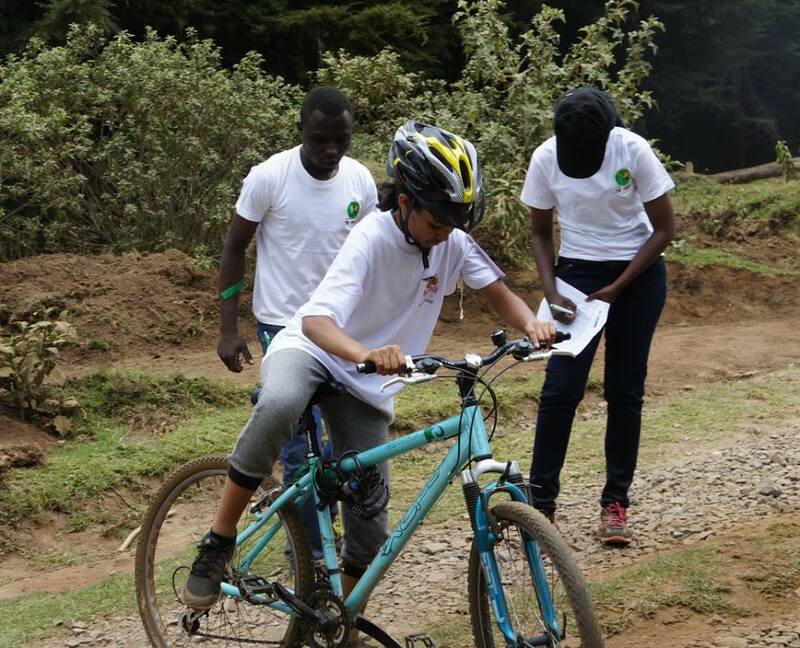 The Forest sought to teach the competitors about Kereita forest ad the community around it through a quiz that each team had to undertake while racing to do the best time on the trail. The questions ranged from what KFS stands for, to exercises that required identifying particular flora ad fauna species as well as acknowledging the wildlife that habitat in the very forest! Competitors had to climb up a tall Cyprus tree and ring a bell at its pinnacle before proceeding to the next activity! We had to run, balancing long logs on the ground and others suspended in the air, maneuver a military kind of assault course before we could move on to the next activity. Touching ground meant having to repeat the entire course and spending more time to complete the triathlon which would amount to losing. We mountain biked on a well marked 1km trail that was full of surprises! 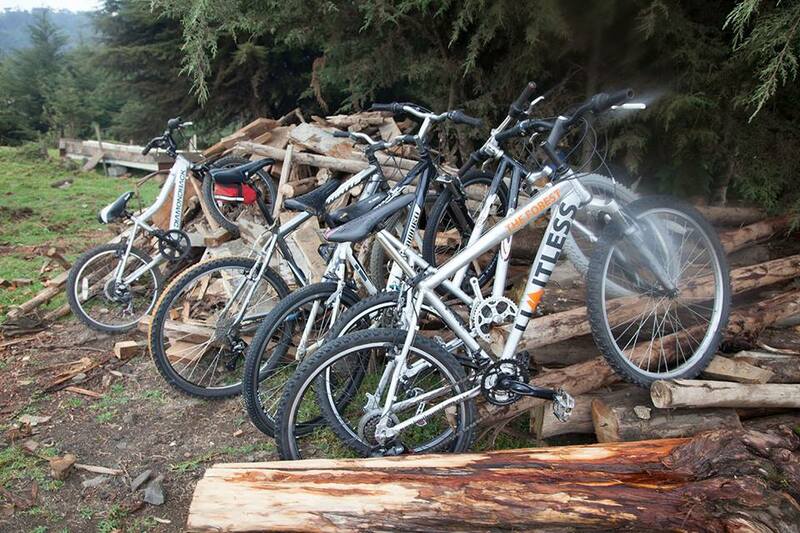 The well maintained mountain bikes made it fun riding through the set trail. The terrain was full of surprises, but I remember my cyclist friend (Vincent Mulama) who once told me that whenever you enjoy a steep descent while cycling, do it as you prepare self to suffer an ascent! The twists and turns on the dusty trail were a mixture of pleasure and pain. At this point, most adventurers were tired and had no idea of the hill that awaited them at the end of the trail. It was not uncommon to see competitors pushing their bikes up the hill to the finish line. It was not uncommon to see competitors pushing their bikes up the hill to the finish line! Endurance is patience concentrated, and that is exactly what team Bunduz exercised to the end of the race! Mingling directly with unadulterated nature while testing my physical limits is an experience that I cannot trade for anything else. Adventure has a way of making us know ourselves and those around us better, therefore handing us an opportunity to live life in a realm of deeper understanding and spiritual awareness. Take on fear by the horns, and endeavour to see what lies past it; only then can you say you live a limitless life! Team Bunduz! So the next time you have time in your hands, you will still have the options of lazying around, indulging in unhealthy past times, or strapping on your boots and taking on a challenging, character building adventure! If your choice is the latter, you know whom to call; Bunduz. Mingling directly with unadulterated nature while testing my physical limits is an experience that I cannot trade for anything else. This was a Sunday well spent! The adventure logistics were organized and executed by the able team sponsor Bunduz. You can catch the next big adventure in the offing come December 2016! If you are an adventurer with a knack for exploring new places, experiencing other cultures and partying some while at it, then look no more. Heed to the ocean call and book your slot in the Zanzibar Trip of The Year! Ask Bunduz about the Nairobi – Zanzibar road trip in December 2016! “I have been running 26km every week since March, in readiness for this marathon! Grueling is what the terrain was, and the sweltering heat didn’t make it any easier; thank heavens for the misting stations along the trail! I am tired to the bone, but hey, it’s all for a good cause!” Said Fred after finishing the Run Wild Run For The Wild 2016 Lewa Marathon. On the road from Nairobi, I traveled with a bunch of happy, singing Hashers all set to take part in a marathon that has made it to the world’s list of top ten ‘must do’ marathons. The Lewa Marathon is revered in the world of runners as one of the toughest marathons in the world! Knowing this, I figured that the pomp and dance the Hashers had was something in the lines of a war-dance conjured to imply courage as they forged forward to the war; The 2016 Lewa Marathon! There’s never a dull day in the Hash House Harriers movement! Commitment to conservation of wildlife and its habitat in Kenya was hallmarked as the Lewa Marathon marked it’s 17th Anniversary; this time hosting over 1300 participants drawn from 28 countries all over the world. A growth in leaps and bounds from the 150 participants the marathon hosted in 2000, the inaugural year. The Safaricom Lewa Marathon is one of the major sporting events in Kenya and in the circles of runners all around the world. The energy of the event and its participants was almost tangible! As early as the first bird chirped to wake the world, runners could be seen pacing up and down their camps as they warmed up their muscles prior to the marathon. There are those that were to run the half marathon (21km) and the elite runners who would cover enter trail of the full marathon (42km). The energy of the event and its participants was almost tangible! The Lewa Marathon gave the spectators as well as the runners the exciting possibility of encountering wildlife on the trail. The picturesque landscapes were enthralling like snippets straight out of a Disney film! Like the proverbial bite and blow from a rat, I assumed the marathon was treacherous for the runners and the natural beauty of the Lewa conservancy was the reliever. Young and old runners gave their best and pushed hard! Every pant, muscle cramp and foot sore being their symbol of commitment to the spirit of wildlife conservation. Through the undulating dirt tracks cutting through the breathtaking Lewa Conservancy, runners sweat it out, with some running strong and others shuffling their feet with an aim to make it to the next water-point and eventually to the finish line. John Ruengo pushing hard. At 86 he is the oldest Kenyan marathoner. As I moved from one spectator point to the next, I was glad to have met one of the child competitors in the Lewa Marathon. The kids take part in a 5km race and are awarded medals on completion of the set distance. “What is your name?” I asked the shy boy walking towards me with a medal dangling around his neck. “Moses.” he replied in shaky voice. “I see you finished the race. What position were you?” I inquired. Meet Moses. One of the finishers in the 5km Children’s race at the Lewa Marathon. I will keep going, no giving up! Effective cooling; A runner goes though the misting station! “I have to keep going,” So James seems to tell himself. As Hal Higdon said, The pride in finishing a marathon is much greater than all the pain endured during the marathon! This was evidenced by the celebration from the various teams, after a grueling day on the trail. Closest to me was the team sponsored by MMC Africa Law. After a few hours of cooling their heels at the Bunduz camp, it was back to party time! I believe that many a runner will agree with me in saying that, Finishing a marathon is a state of mind that says anything is possible! To the runners in the Run Wild Lewa Marathon, the organizers, the sponsors of the various teams in the marathon, the journalists covering the event, the entertainers and the ever so kind spectators handing bottles of water and energy bars to the runners, we finished the marathon! Finishing a marathon is a state of mind that says anything is possible! On the rocks is how I wanted my drink served after a long day out chasing after charge cars. On the rocks is where every competitor and spectator that made it to the Gauntlet found themselves. On the rocks is where I found my relationship with Safaricom degenerate to when I found out that the gauntlet was their guard-post, yet there was no network coverage! On the rocks at the Rhino Charge 2016 gauntlet! “Should you ever go to your village and not connect to your Safaricom line, this is the guy to call.” That is how I had been introduced (on the eve of the charge) to the signal guru that Safaricom had dispatched to the Rhino Charge 2016 venue. As I paced up and down the gauntlet, I couldn’t help but wonder where and how he had lost his mojo. I later met him and he explained in an embarrassed mumble, from underneath a Safaricom branded cap that; it was difficult to get network coverage at the gauntlet because it was smack in the middle of a depression. I walked away and stripped him of the title guru in four steps; a letter down with each step. Rhino Charge 2016 was set in the vast and picturesque Narok County, the home of the world renowned wildlife reserve; Masai Mara! As we drove there aboard Ki-Pumpum, I wondered what adventure the charge had in store for us this time around. Would I be able to get good shots? Is the terrain taunting enough for me to maybe get a shot of a charge vehicle toppling over several times and back on it’s four wheels? Would I be in a position to visit most guard-posts and spy on charge vehicles as they tore ravenously through the thick bush in a bid to win the top prize? I had to wait until the charge day to find out. Bunduz adventurers relaxing on arrival at the venue. Ki-Pumpum rests in the background. For the past 27 years, why does a group of people get out into the wild to find a new trail where millions of shillings are torn away in the form of all-terrain vehicles that maneuver a 12 point circuit spreading over approximately 100km, in a duration of 10 hours? One would wonder. Year in, year out, why do spectators throng the often harsh environment to witness embellished vehicles clamor over rocks and tear through bush while driven by enthusiastically calculative crews that stop at nothing unless their vehicle is reduced to a heap of junk metal? As I retired to my safari chair right by the Bunduz camp bonfire, I watched spectators share their tales from the charge day that had just ended. As we braved the cold dark night of the Masia Mara, I quietly scrolled through the shots I had taken, and that’s when it all dawned on me; the spirit of the Rhino Charge is one charged with the resilience of a people committed to the conservation of the Kenyan wildlife, nature and catchment areas through the protection of mountain echo-systems. The spirit of the Rhino Charge will stop at nothing to see that conservation is upheld! Let that model pose not fool you. The ladies driving Car #19 had super skills! Through it all, and stopping at nothing! Just a scratch, let’s push on! There is only one way down this rock! Go straight through that bush! Hang on, can I find a better route? This is the winner of Rhino Charge 2016! From the full adventure cooler box Stronger Simtank, refreshments flowed freely as spectators enjoyed. A charge car leaves the venue. It was time to say goodbye. I have always found myself drawn to adventures that have high adrenaline activities tucked somewhere in the itinerary. In my recent travel escapades, I have noted that activities once tagged as a preserve for the daring are now a staple sought by many a traveler! Some take part in these activities to pursue that rush that leaves a soul feeling indomitable (albeit for a few hours), others do it to earn bragging rights among their peers, while others truly seek that spiritual angle of being one with nature while in a solo stand of defiance; more like the dance battle some animals indulge in prior to a steamy session of passion! Whatever your reason to seek out these high adrenaline activities are; I hereby give you a list of the seven must do activities (in Kenya) to leave your heart with a drum-thump of a pump! Get into a noisy cessna 206 plane with no door, hit heights of up to 12,000ft and jump out! Show me madness if this is not it! Leaping from these dizzying heights is certainly not for the faint at heart. The ‘lunatics’ at the Skydive Diani have taken this a notch higher; with oxygen systems installed in the powerful and fast bird that tears through the hot and humid Diani air at ease, you can now join them in a 22,000ft jump (highest jump ever done in Kenya) and fly through the blue reaching terminal velocity of up to 200km/h in a 55 seconds free fall of pure adrenaline! A smooth parachute landing on the Diani Beach will calm your nerves with the scenic 5,000ft gentle drop back to earth. For only Ksh.35,000/- this is an experience you certainly don’t wonna miss! You know you are an adrenaline junkie if soaring high like a bird soaking in the picturesque scenery below ever made it to any of your day dreams! Dream no more, head out to Kerio Valley and make this a reality! Jumping off high hillsides or cliffs and setting out into a flight high above the earth is a lifetime experience worth taking. With no age restriction, no prior training or experience required, Paraglide Kenya can tailor-make a flight for you. For the sane nature lovers, a gentle scenic flight would be in order while for the ‘nutters’ seeking the rush, an adrenaline-filled joy ride would be the best serving. For only Ksh.8,000.00 be a bird high up in the sky for 15-20min! Until you have climbed up the 60 meter steel structure with the sole intention of jumping off it’s edge and down towards the torrential Tana River, then you cannot quite call yourself an adrenaline junkie! As you climb up to bungee, the wind blows against you as if in a torment to measure your determination to jump. 220 steps later, you are at the top and in the jump cage. Your view below is that of Sagana, the Tana River and the farm lands on its banks. Observing the highest standards of safety your upper body is harnessed and an elastic chord is tied around your feet. As soon as you assume the ‘Jesus position’, you are ready to bungee! 3,2, 1… and off you leap! Some say they feel their heart float, while others say they feel it in their mouths during the free fall until the bungee rope kicks in. For as little as Ksh.5,000.00 find out what you will record as your experience! Common sense will dictate that we avoid torrential rivers, particularly those with whirling rapids and falls. On the other hand, adventure sense will nudge us to wonder what it feels like to be engulfed in a rapid or tossed down a waterfall as one with the raging water! White water rafting is the white-knuckle adrenaline thrill waiting to serve you this very experience. River Tana provides grade 3- 5 rapids depending on the seasons. Grade 5 rapids are something close to dancing with the devil or step dancing on the edge of a strict cliff! On-board an inflated raft, armed with a sturdy plastic paddle and shielded by a slight helmet and a life jacket, be the warrior that braves the raging waters, the occasional menacing sharp rocks and live to tell the tale. Savage Wilderness will arrange your date with the rapids. Water in oceanic abundance has a thrill in itself. Swimming has its limitations and may even come-off as not ‘dangerous’ enough for an ardent thrill-seeker. Now imagine riding an agile fast machine in the open ocean and accelerating from zero to speeds of about 60km/hr in just a matter of seconds! If this has started to sound tantalizing in any way, come out and declare self a daredevil! Jet skiing is your thing! Get down to Mombasa and rent out a jet ski from as little as Ksh. 2,500.00 and zoom off into the vast ocean. Be it on two wheels or four wheels, nothing beats the feeling of igniting a motorcycle engine, pushing in the clutch, hitting the gear shift into one and letting go of the clutch to set off into motion raising a trail of dust as the monster bike swings into action! Adrenaline rush is almost squarely synonymous with motorcycle riding. Various locations offer exhilarating dirt bike trails. Some trails are demarcated (http://www.chakaranch.com/), while some cockily tear through the wilderness, literally passing among herds of wilder-beasts and giraffes as they forage in the Kenyan grasslands (http://www.lukenyamotorcross.co.ke/) From as little as Ksh. 5,000.00 get onto a buggy or a quad bike and race your friends through the dusty or muddy rough terrain of the unbeaten tracks! On a harness attached to a cable (30ft above the ground), you will be propelled by gravity between two points across the Machakos People’s Park! You will have the option of choosing between the 200m or 300m long cable. The speeds vary depending on how you’d like to enjoy your ride. No where else in Kenya will you find a zipline this long, this high and integrated into a truly spectacular park setting. With the buzz of activity below you and depending on how good or evil you are, you just might feel like Santa flying over chimneys on Christmas eve or like a witch flying her broom in the night! Ha ha!